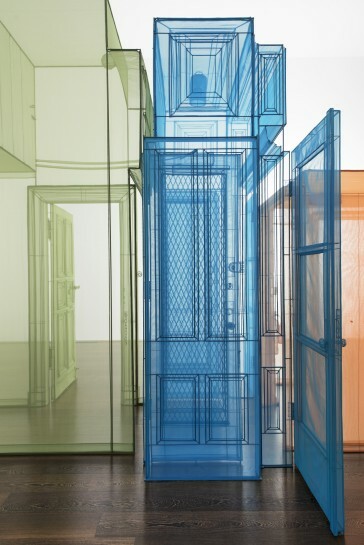 Do Ho Suh’s ‘Passage/s’ is a timely look at what it means to feel at home in a globalized world. The exhibition’s three sections are reached by making your own patient passage up steep staircases and through the garden at Victoria Miro’s Wharf Road space. In each, different media – thread drawings, photographic blueprints, polyester fabric installations and video installations – have been used to reproduce mundane objects and experiences that form the backdrop to modern life. These include replica doors and entranceways, lightbulbs, plugs and toilet seats from the many places Suh has called home (London, New York, Berlin, Providence and his hometown of Seoul). Each is named after its address of origin, listed like a serial number. Suh’s nine ‘Hubs’ (2015–16), on the upper floor of Gallery II, are one-to-one reproductions of these apartments’ transient spaces: doors and passages between rooms. Made of delicately stitched-together pieces of translucent coloured polyester, supported by sturdy stainless steel pipes, they lead onto one another, stretching across the space like one long corridor of contradictions. On the one hand, they look like a long piece of playground equipment, but even as you scuttle between them, you are never fully immersed in play. On the other, these interiors, though exquisitely detailed, have lost their practical function – door hinges are unbending, power sockets are powerless.